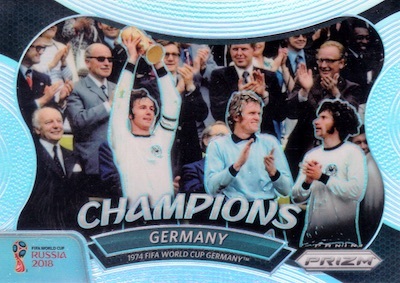 2018 Panini Prizm World Cup Soccer brings fans to the 21st edition of the global tournament, this time held in Russia. Each hobby box includes one autograph or a short-printed insert. 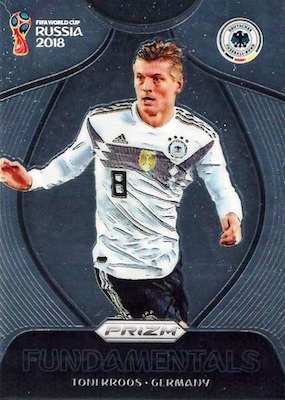 It may not have the same mainstream appeal as the long-running World Cup Sticker set, but Prizm World Cup exploded on the scene in its 2014 debut. Expectations are understandably high for the sophomore effort. 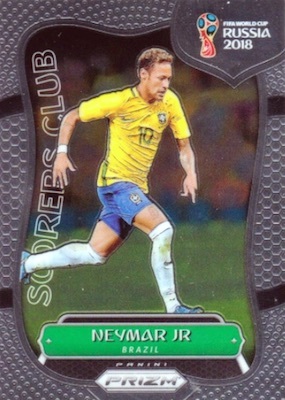 Covering all 32 teams in World Cup 2018, the base set consists of 300 cards. Of course, colorful rainbows can be collected for key players thanks to the many Prizm parallels. Limited options include Silver, Hyper, Green & White Wave, Purple & Gold Wave, Blue (#/199), Red (#/149), Purple (#/99), Orange (#/65), Green Crystals (#/25), Camo (#/20), Gold (#/10), Gold Power (#/5), and Black (1/1). Collectors can expect an average of 16 Prizm parallels per box, with three being numbered to 199 or less. 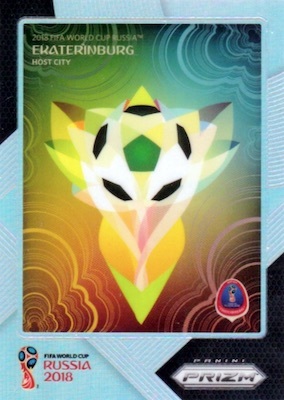 There are also special hot boxes containing Lazer Prizm parallels. In honor of the host country, the short print Cyrillic variations feature the distinct text for the player's name. Averaging seven inserts per box, the 2018 Panini Prizm World Cup checklist provides the FIFA debut of National Landmarks. 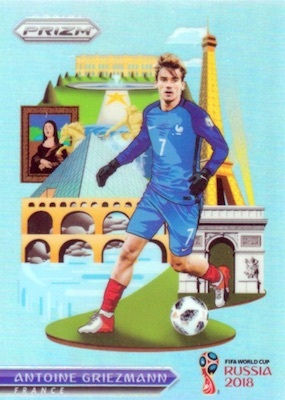 This illustrated insert combines top players with famous locations from their country. In addition, New Era highlights young stars making their first World Cup appearance, and Scorers Club naturally focuses on the most prolific goal scorers. 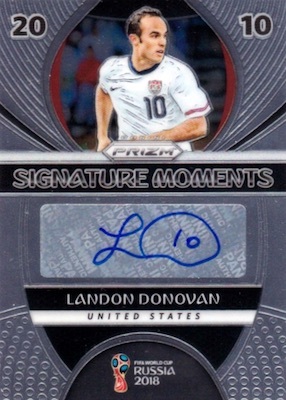 And then we come to the World Cup Prizm autographs. 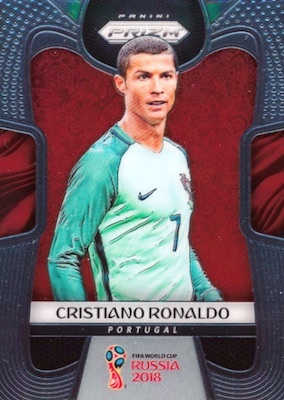 Showcasing top current players, retired names and rising stars, Cristiano Ronaldo headlines the 2018 Panini Prizm World Cup checklist. 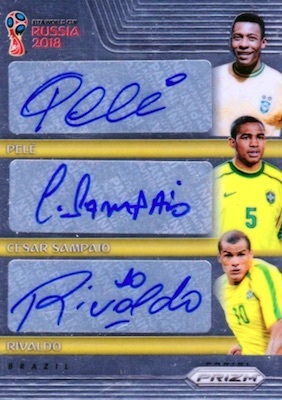 The single-player Signatures insert is joined by Dual Signatures, Trio Signatures and Quad Signatures. Each option is joined by Prizm parallels like the one-of-one Black. 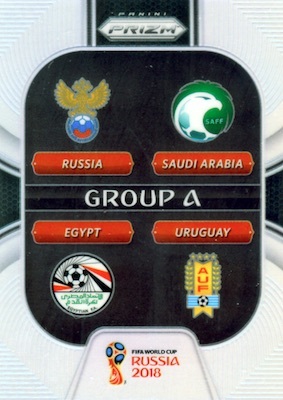 Although the majority of the release only covers teams participating in World Cup 2018, Road to Russia looks back to seven top players from qualifying in a signed SSP insert. This allows some coverage for the United States, who ultimately did not qualify. 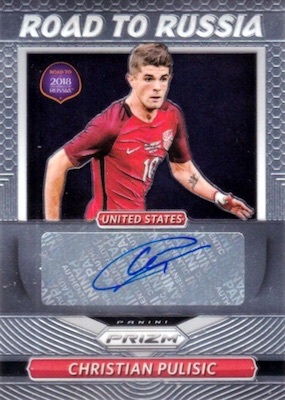 2018 Panini Prizm World Cup averages seven autographs per 12-box case. 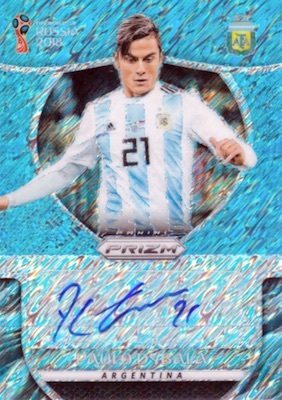 Nemanja Matic 2018 Prizm World Cup Autograph. Serbian star! PRIZM PARALLELS: Silver, Hyper, Lazer, Mojo, Red Mosaic, Black/Gold Wave, Green/Orange Wave, Red/Blue Wave, Blue #/199, Red #/149, Light Blue Lazer #/125, Purple #/99, Orange #/65, Pink Lazer #/40, Green Crystals #/25, Camo #/20, Gold Lazer #/15, Gold #/10, Gold Power #/5, Blue Shimmer #/5 (FOTL), Black 1/1. 47 cards. Shop autographs on eBay. PRIZM PARALLELS: Prizms #/25, Gold #/10, Black 1/1. 43 cards. Only in 1st Off the Line boxes (FOTL). Shop autographs on eBay. 18 cards. Shop autographs on eBay. PRIZM PARALLELS: Gold #/10, Black 1/1. 11 cards. Serial numbered #/30. Shop autographs on eBay. PRIZM PARALLELS: Prizms #/20, Gold #/10, Black 1/1. 7 cards. Serial numbered #/25. Shop autographs on eBay. PRIZM PARALLELS: Prizms #/15, Gold #/10, Black 1/1. PRIZM PARALLELS: Silver, Gold #/10, Black 1/1. PRIZM PARALLELS: Mojo #/25, Gold Power #/5, Scope 1/1. 32 cards. 1 per case. 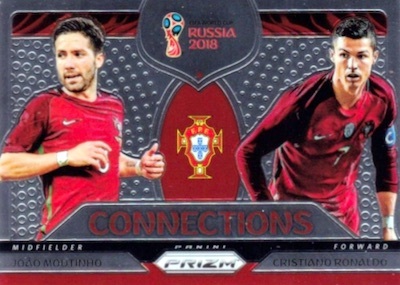 View the 2018 Panini Prizm World Cup Soccer checklist spreadsheet. Cant wait for this to come out. Panini takes a great product and makes it the worst it can possibly do. Ugly design, too many parallels, too many pointless parallels with same numbering, terrible checklist, sticker autos, overproduced. There’s really nothing good that can be said about this set at this point. If its not broken don’t fix it. Not a hard concept. Gotta say – I just LOVE all the parallels!!!! Average product. Way too many parallels. Very difficult set to put together. Got two autis out of five boxes. 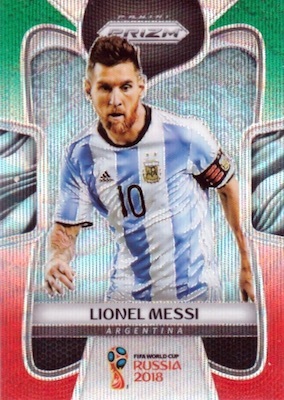 Only one Messi base card. Insert sets are basic looking. Love the National Landmarks insert they are cool looking. Sticker Autos not the greatest. Overall not close in quality as 2014 set. I love soccer in general, and these cards are wonderful, but I can’t help but feel let down after buying 3 hobby boxes and getting zero autographs, and only 1 gold card numbered to 10. Doesn’t seem right. Agree. Almost impossible to complete without spending hundreds of dollars. Panino really let us down with making the host cities and group cards hard to get. Why would anybody want a single group card? They should have been part of the base set. If you agree, write to Panini America complaining. Maybe then they would realize their oversights and change. 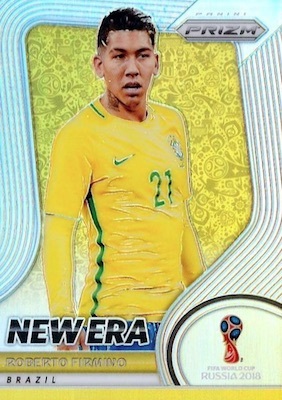 Not collecting future world cup cards again. I was watching a break online and the guys keep saying Mojo parallel. When I looked at this article I didnt find it. Can u help me understand this? It’s a distinct parallel style for the base set and listed with the base parallels in the checklist above. They have a chainlink pattern in the background. 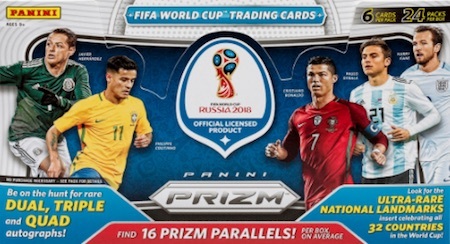 2018 PANINI PRIZM FIFA WORLD CUP SOCCER HOBBY BOX.